DONETSK, Ukraine -- Pro-Russian rebels erected new barricades on the streets of Donetsk on Monday, preparing to make a stand in the city of a million people after losing their bastion in the town of Slavyansk in the worst defeat of their three-month uprising. Russian rebels remove a Soviet era T-54 tank from a historical museum in Donetsk July 7, 2014. Ukraine's richest man, Rinat Ahmetov, pleaded with the government on Monday not to bomb his home city. Local authorities say thousands of residents have left Donetsk, but most have nowhere to go. The Kiev government has said it will act quickly to seize back more territory from the rebels after re-taking Slavyansk over the weekend in what President Petro Poroshenko called a turning point in the conflict. Rebels retreating from Slavyansk, some driving armoured vehicles flying Russian flags, drove 110 km (65 miles) south into Donetsk over the weekend. About 1,000 of them held a bellicose rally in the central square on Sunday, and on Monday many were visible on the streets, having established checkpoints to check the documents of drivers. Their presence drew a warning from Donetsk's local authorities. "There are men in camouflage and with weapons on the streets. We ask residents not to enter into arguments with these people and be extremely careful," said a message from the town municipality. Although most shops and businesses were still open, some were shut, and residents spoke of their fear that government forces could soon attack. "The atmosphere is very tense now. There is no prospect of a future. You go to sleep in alarm and wake up in alarm," said Konstantin, 28, a cook. "The Kiev authorities promise to tighten a ring around Donetsk and meticulously clear it of fighters. I don't know what to believe in any more. Donetsk is bigger than Slavyansk, but it seems to me it won't end with one single ring. All the same I have the impression the fighters will yield their positions." The rebels' commander, a Muscovite using the name Igor Strelkov, was quoted by Interfax news agency as saying his men would fight for the city, which was "much easier to defend than little Slavyansk". Strelkov's whereabouts were not immediately clear. Rebel sources said two other prominent local separatist leaders, Alexander Boroday and Denis Pushilin, were both in Russia. 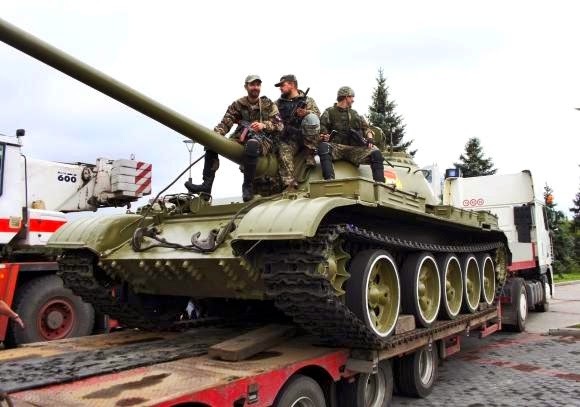 Armed men who appeared at Donetsk's local war museum with heavy lifting gear winched a World War Two tank onto a flat-bed truck and drove it off. Squatting on top of the tank, one of them told a local online journalist: "We have got an engine to go in it. We have got some experts. We have to add the engine, ease the turret and it will be a working battle tank." It would be useful, he said, in the bid to "free" Donbass, a heavily industrialised basin in which Donetsk and Slaviansk sit. The retreat from Slavyansk appears to have hurt the morale of the fighters, who have held sway in some eastern towns and cities since rising up in April. One fighter from a group called the Vostok battalion, who declined to give his name, said: "It's a real mess. But we are being badly hit by artillery. We don't even see it coming." Just outside Donetsk, a railway bridge running across the main road connecting the town to Slavyansk was blown up on Monday as a cargo train crossed it. It was not clear who had carried out the attack. The city is the headquarters for Akhmetov, Ukraine's wealthiest man by far, whose fortune, founded on coal and steel, is put at more than $11 billion by Forbes. He said government forces should show restraint in the surrounding Donbass region. "Donetsk must not be bombed. Donbass must not be bombed. Cities, towns and infrastructure must not be destroyed," he told Ukraine television. "We must avoid suffering and deaths of peaceful people." Maksim Rovinsky of Donetsk's town council said 20,000-30,000 residents had left - "people who had somewhere else to go to". The government said it had carried out an air strike against rebel fighters who had attacked the airport in Luhansk, another eastern city, on Sunday. It accused separatists in the area of opening fire in populated areas disguised as government forces. The Defence Ministry said early on Monday separatists had launched 10 attacks on government posts and army positions in the previous 24 hours with mortars and small arms. It gave no details of the incidents or casualties, but said troops had returned fire: "The terrorists were given a fitting reply." More than 200 Ukrainian troops have been killed as well as hundreds of civilians and rebels in the conflict. Separatist rebellions erupted in mainly Russian-speaking eastern regions of Ukraine in April after Moscow annexed the Crimea peninsula in March, following the overthrow of a pro-Russian president in Kiev in February. Rebels have been barricaded into government buildings in Donetsk, which they declared capital of an independent "people's republic", but until now the city mostly functioned normally. Slavyansk, with 120,000 people, was the town where the rebels exercised the most control and where fighting was fiercest. Strelkov, the self-appointed rebel defence minister whose real name is Igor Girkin, was quoted by Interfax as saying 80-90 percent of his men had escaped from Slavyansk. They were now organising the active defence of Donetsk, he said. Recapturing Slavyansk has given Ukrainian forces by far their clearest victory after months of patchy performance against the heavily armed fighters, many of whom are Russians who crossed the border, although Moscow denies supporting them. Poroshenko, who called his security chiefs for a meeting on Monday night, ordered the assault on Slavyansk after abandoning a unilateral ceasefire last week, arguing that the rebels had refused to abide by the truce. "My order is now in effect - tighten the ring around the terrorists," Poroshenko tweeted on Sunday. "Continue the operation to liberate Donetsk and Luhansk regions," he said. Anton Herashchenko, an adviser to interior minister Arsen Avakov, told journalists on Monday the morale of the fighters was "extremely low. They feel abandoned, betrayed, deceived". Asked why government forces had not struck from the air at the rebels as they drove off to Donetsk in a convoy, he said: "There could have been hostages among the fighters whom they'd taken in Slavyansk as a human shields." He said government forces were now protecting the border against any further infiltrations from Russia. "If any armoured vehicles or Kamaz trucks cross from Russia, they will be destroyed from the air or by artillery fire," Herashchenko said. In Slavyansk, where Ukrainian flags have replaced Russian flags atop government buildings for the first time in months, around 200 residents lined up in the central square on Sunday for meat, potatoes, onions and bread distributed by troops. "Everything is different now. Tonight is the first night with no shelling," said Mikhail Martynenko, 58, a guard at a local market near Slavyansk. "People are in a better mood, and there are more people on the streets. Everyone was afraid. They had no idea when another mortar would come flying." Ukraine's victory in Slavyansk has now pushed informal peace talks involving separatist leaders off the agenda. A meeting of a so-called "contact group" involving Ukraine and Russia had been planned for the weekend, under an agreement in Berlin last week, to discuss conditions for a truce. The Organization for Security and Cooperation in Europe website said "high representatives" from Ukraine, Russia and the OSCE did in fact meet in Kiev on Sunday, though separatist leaders did not appear to have attended. In my personal opinion Ukrainian Government should make some efforts and proposals to civilian population in Donetsk and Luhansk to evacuate the city prier to the assault on them. Government should allow at least 10 days for people to move out. That will send the signal to separatists of possibly serous and strong move.